Recently, travel writer Niki, who blogs at Adventures of a Mid-Life Mommy, had the opportunity to visit the Smoky Mountains region and stay in one of our cabins. Niki is a Tennessee native and no stranger to the Smokies, but she was excited for this opportunity to get away from the hustle and bustle of city life for a spell and share some of the magic of the mountains with her family. Niki has fond memories of the Smokies and Gatlinburg from when she was a child, so she is always delighted to know that the quaint, charming vibe of the town and the friendly residents are still hallmarks of the experience of visiting here. 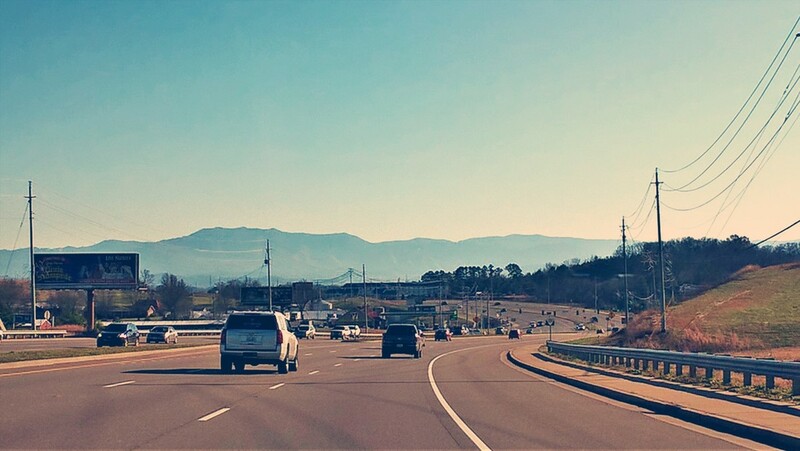 Those initial views of the mountain range in the distance as one crosses into Sevier County never fail to make her feel like she’s coming back home to a beloved place. She and her family stayed in our beautiful cabin named Cypress Lodge, which is a four-bedroom, four-and-a-half-bath unit with a fully furnished kitchen and all of the amenities that a family could need. During her trip, Niki and her family explored many different areas of the Great Smoky Mountains National Park. She and her husband even snapped a picture of the two of them in front of the park’s entrance sign, which some people might consider a cheesy tradition, but is also a memory that will last a lifetime. The weather was exactly what you hope for in a mountain vacation in the winter: cool with some snow on the ground, but still pleasant enough to get out and experience the park. Niki notes that Cypress Lodge was the perfect accommodation for her family. Her kids adored the lower-level entertainment center with games and a state-of-the-art, theater-sized HD screen for watching movies. Niki and her husband relished their mornings spent sipping lattes and chatting in the spacious kitchen. And the four bedrooms with king-size beds provided plenty of room for everyone in the family to relax in their own space. But even more than all of the bells and whistles of her cabin, the thing that Niki appreciated most about her stay is what makes this place so special for millions of visitors every year: sharing those majestic views of the mountains with her loved ones. She especially loved being able to sit out on the deck of Cypress Lodge with her husband and a blanket, taking in every bit of how beautiful this area is, and how lucky we are to be able to experience it. You can create your own Smoky Mountains adventure, just like Niki and her family did, when you choose to stay with Cabins of the Smoky Mountains. We have a wide variety of cabins to suit any group, from a solo traveler to a large combined family. No matter which cabin you choose, you can be sure you’ll get the personalized service that we provide to each of our guests, as well as your own piece of Smoky Mountains magic that you can cherish for a lifetime. We’re always glad to read other people’s view of cabin life. We think it’s special of course, but it’s fun to see what others find the most appealing attributes of a cabin vacation in the Smoky Mountains.